Refer to the second image I posted above, only click on the "listen" tab. In there, you should find a volume setting that will (hopefully) let you hear the output on your computer speakers (or headphones) when you plug them into your tower. As for the various "line output" types (1/4" jack vs. RCA jack) that's more a function of "age" than anything else, though I guess I'm not surprised that the reel-to-reel has a higher signal level output. Standards change! 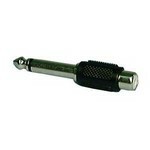 From what I understand the 1/8" (3.5mm) round headphone plug/jack may be "obsolete" soon. It will depend a little on your computer, whether you have a laptop, or a desktop, and the specifics of it. But if you have a desktop/tower computer, look on the back, for a collection of 1/8" holes. They will likely be color coded, green, blue, black, red... there may be up to 6 of them, there may be only 2 or 3. In most cases, you can use the blue jack as a "line-input", or, again, depending on your hardware, you may be able to designate which jack you want to use as the line-in jack. 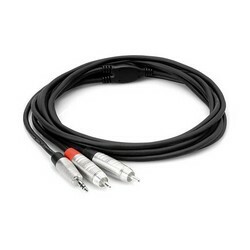 You would then get a "Y" adapter to go from two RCA plugs (which will attach to your reel-to-reel deck) to a single, 1/8" (3.5mm) stereo plug, which will go into the line-in of your computer. If you have a laptop, you may have a red input jack, which may be able to be configured as a stereo line-in jack, and use the same "Y" adapter mentioned above. 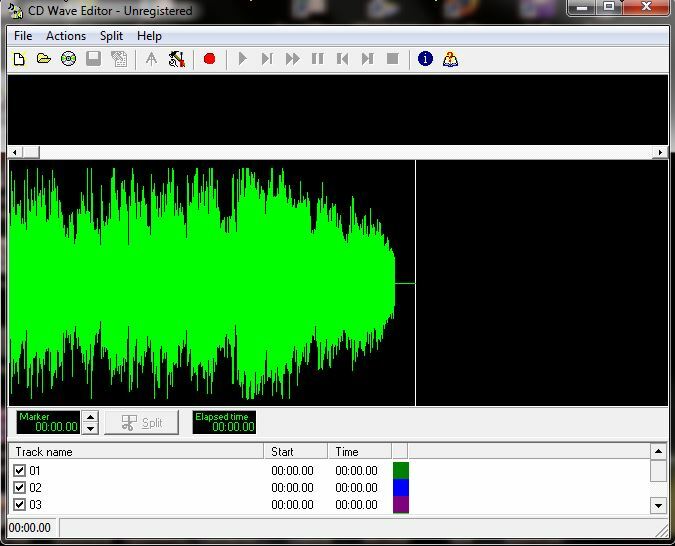 From there, yes, you could use Audacity, or Goldwave, or ...insert name of program here... to capture your audio and make your CDs. I do not do a lot of Audio work but I understand that Audacity offers more capabilities and options than Roxio's Sound Editor... So you may want to look at theirs as well. They have a free download so you could take it for a test drive. Johnr9q, you never told us you actually had the product, or that you were having a problem getting it to load. We might have been able to solve that problem. But, in any case, I wish you luck with your project. As an aside, and since you don't have a Roxio product, I would offer that I most often use, CDWAVE to do my initial audio capture, and to split out the individual tracks. You can find it here. Dewey Wright: Your reply was most helpful. I do have those 1/8 inch inputs, I think 6 of them. I read elsewhere that I can just use the programs already on my computer to do what I want. (maybe my sound card - whatever that means) I don't really want to edit anything except when I put the MP3 files on CD's I would like to be able to select segments in the playback on my CD player so I can go to a specific segment. (I'm probably not describing it correctly but here's another try. When I buy a music CD all the songs on on their own individual tracks that I can select. I have a PC with at tower and Windows 7. If I can't use my "sound Card" for that purpose, does any software come with Windows 7 that allows me to do what I want or do I need to get some? As you can tell, I'm not computer literate so I want to do something that is very simple. First, eliminate the idea of MP3 files until AFTER you make your CDs. You want to capture and work only with .WAV files. They're larger than .MP3 files, but they also don't have any compression or audio loss. I'm assuming you care about and want the best quality you can get, so do all of your capturing to .WAV files. I don't think Windows 7 comes with any software that will easily let you do the basics that you want to do to capture and split out your audio tracks. Again, I recommend that you download CDWAVE, it's a fully functional program, to do the initial capture of your tapes and then splitting into individual tracks. (It doesn't do any burning to CD.) By splitting out the tracks into their own .WAV files, when you put them onto CD, you'll get the indexing capabilities that you want. 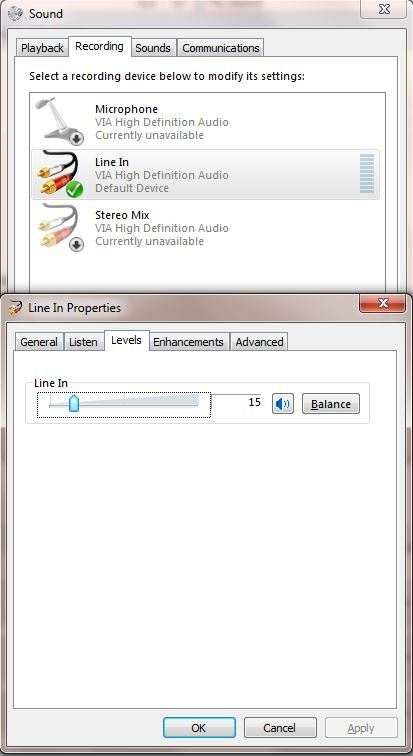 As an added benefit, CDWAVE automatically splits tracks on sector boundaries, so that if you have a live recording with no silence between the tracks, the split won't cause any audible "glitch" when played back from the CD. I believe you can use Windows Media Player to then put the tracks you've created onto CD. (I've never done that but I believe it has that capability.) Your PC should have the hardware capabilities built in to do the audio capture, based on your description of the available jacks on the back. Once you've got your tracks recorded to CD, then you can consider converting your .WAV files to .MP3 files for use on a portable player, or some other device. But stick with the larger .WAV files up through recording to a CD. Just for full disclosure, I have a large collection of my music available as MP3 files at work, which I listen to most of the day, so I'm not against their use, I'm just trying to keep the best quality you can for your CDs. Deweywright: Again, thanks for your help. You said: "First, eliminate the idea of MP3 files until AFTER you make your CDs" I don't understand what you mean by this. I thought the process whet like this: Hook my reel to reel deck to my computer, play the reel to reel while recording the sound on my computer, then burn that sound onto CD's that I can give to people that they can then play on their DVD players. I don't see how that jives with what you're suggesting, that I do something with the CD's after I make them. What am I missing? Sorry I'm so illiterate. Yes, you are recording from your real-to-reel deck onto your computer. As you capture the music, you have the option of what file type to capture to. 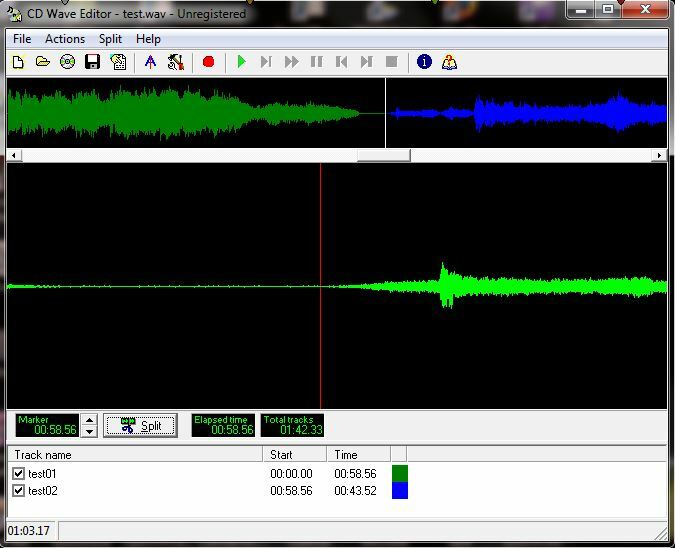 A .WAV file, is a straight up representation of the digitized music from your sound card. There is no compression, and the files will be roughly 10MB per minute of music. A .MP3 file, is a compressed, smaller version of a .WAV file. In order to make the file smaller, some of the music has to be "lost." 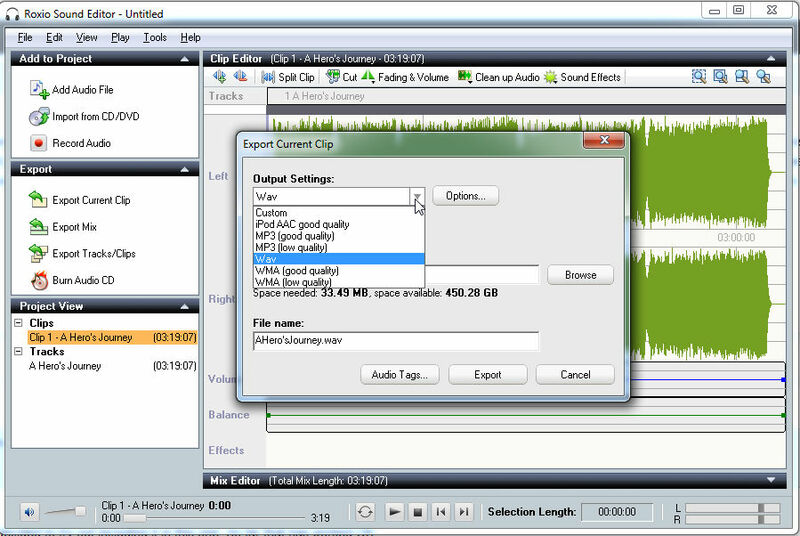 You want to avoid losing audible information, and the easiest way is to save your files as .WAV files. Also, if you're making audio CDs (not DVDs) then the .WAV format is essentially identical to what goes onto the CD, there's no conversion required. So yes, we're starting to talk, "computerese" here, talking about file types. That's the (usually) 3 characters at the end of a file, like Song1.WAV or Song1.MP3. They may be the same song, but the .MP3 file will be significantly smaller. At that point, it becomes a matter of how discerning a listener you are, and what the environment is that you're listening in as to whether you would notice the difference in sound between the two files. But let's save that discussion for later, after you start getting some of your tapes captured onto your computer. Just a suggestion ' there are a lot of "How to's" on YouTube. Search for them. Here is one that you can use. (link) It answers a lot of your questions. It uses "Audicity" as the audio capture/editing. Audicity is free and mostly easy to use. You didn't e-mail anyone. You private messaged Jim. The private message feature, that you used, is to send a private message to another user on these boards, not for sending an e-mail to Roxio/Corel tech support. sknis: Thanks for your help. When I click on the link you provided, it doesn't take me anywhere except to the top of this page. Can you check it out? You guys are all a great help. Now I'm sure I will be able to do this project by myself. I'm not sure how that happened but here it is (link). Thanks Sknis. That video was very helpful. I will be out of town till next monday so won't be on this forum and won't be able to try out what you all have suggested. I'm back. I went rock climbing in the eastern Sierra. I went to Best Buy yesterday to purchase the adaptors to be able to hook my reel to reel to my computer. As d_deweywright pointed out my computer has an "Audio In" 3.5 jack. The output on my reel to reel is 1/4 in plug. The fellow at Best Buy (He seems very knowledgable) told me the best way to do this is by using their audio recorder: http://www.bestbuy.com/site/audio-recorder-2-0-deluxe-windows/3345338.p?id=1218396588553&skuId=3345338He said If I hook my reel to reel directly to my computer sometimes there is too much volume coming out of the reel to reel and this causes problems. Their product has a processor that apparently eliminates this issue and facilitates making the connection from the reel to reel to the computer. It has usb out of their processor and usb into my computer. If you all don't think I need this processor, I'm having trouble finding a cord that will take the output of my tape recorder (two 1/4' mono female ports) to the input on my computer (one mono female 3.5mm jack) can someone suggest where I can get that. They didn't have it at best buy. As I said earlier, I'm not at all computer literate so want to this very simple. I'm sure it will make no difference if I use a Wave file or a MP-3 file as the reel to reel recordings are not very high quality and mostly voice I recorded with not so good microphones. Probably the only editing I will want to do is (like I said earlier) is create tracks on the final audio CD. The fellow at Best Buy said, unless the hiss is very bad, which it isn't, I shouldn't even edit out the hiss cause I would destroy some of the sound quality.So what would be the easiest way to do what I am describing. d_deweywright: You suggested using CD Wave. I looked that up on Youtube and there were no tutorials for it whereas Audacity has a bunch. Believe me, I need all the tutorials I can get. The guy at Best Buy was trying to sell you essentially what you already decided you didn't need from Roxio. CDWave is very easy to use. Download it and install it. Then start it up. The Frequency, Channels, and Resolution shown above are what you want to use. You can use the "Test Mode" to set your levels to make sure you're recording at the right levels before putting anything into a file. You'll have to go into your Sound option in Control Panel, make sure you have a Line-In set as the recording device (your system may call it by a different name, but when you have the right one selected, you should hear sound from your tape coming from your computer speakers). Then double-click on that, click the "Levels" tab, and you can control the volume you're recording at. After you get your levels set, make sure you select the "File" option in CDWave, and give it the location and name you want to record to. I still recommend using .WAV files because it's less processing for your computer, and less to set up. Faster, and easier. Then you can set the vertical cursor where you want, and use the "Split" button to create separate tracks that you will later put onto your CD. It's easy to use. You won't break anything if you do something "wrong". Try it and learn. Oh, and if you're more comfortable using Audacity with Youtube tutorials, feel free. I have no stake in CDWave, other than I've used it for many years. 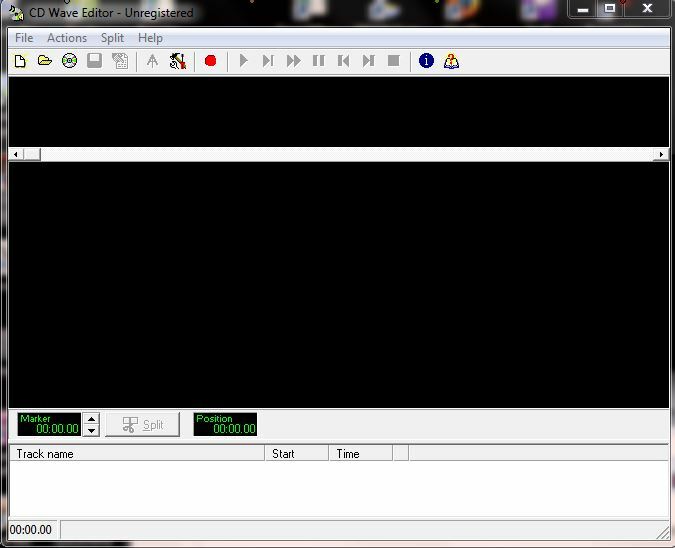 I've never used the Windows Sound recorder before, and had never looked at it before this morning, very briefly. I'd still suggest either CDWave or Audacity. It looks like Sound Recorder only lets you record as .WMA files, and I'll continue recommending that you record as uncompressed .WAV files. I think you'll also get better indicators for your recording levels with CDWave or Audacity to help you avoid clipping your signal. You'll also need other tools for splitting up your recording into separate tracks which either of these programs will provide. It's a little hard to diagnose it remotely without really knowing your system. If you've got a friend that knows computers, maybe you can invite them over to help you out. I found the problem. Only one of my speakers was working. Ha! Excellent! I'd actually considered asking if you'd verified your speakers were good... Glad that was the solution and that you found it. D_Deweywright. I have just about all my tapes transferred to my computer now. 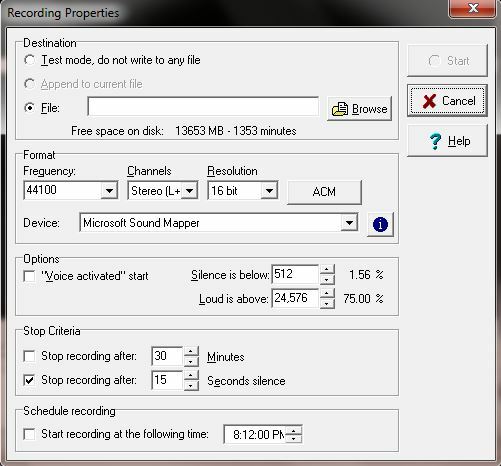 I have been using the Windows 7 "Sound Recorder" and it does everything I need. I don't need to do any editing. I end up with a WMA file. What's your opinion on putting the WMA file on the CD for the final product for me to give to people for them to play on their CD/DVD/Blueray players? I burnt one CD and it played fine on my Blueray player. Some say I should use WAV or MP3. Another question: I have some homemade VHS tapes that I want to burn to DVD. I don't need to do any editing. What would be the easiest way to do it? To play on a regular CD player, you need to create an Audio CD, which I believe you can do with Windows Media Player. Don't ask me how, because Windows Media Player and I do NOT get along well. But I believe if you put a blank CD into your computer, that is actually one of the options that comes up, to create a disc with Windows Media Player. Someone else here may jump in and give you the steps to do that. By putting .WMA files onto a disc, you're creating a Data disc, which, as you've found, plays okay on your blueray player. That may not be true for every player, and certainly not for a plain-jane CD player. Of course, an Audio CD will only hold about 80 minutes of audio because it is decompressed to full CD-DA quality, where if you just put the .WMA files on as a Data CD, you can probably put many more hours on, but again, that won't be playable in every player. To put your VHS onto DVD, you'll need some actual hardware to capture the video. You might consider Roxio's Easy VHS to DVD 3 package. Unless you've got a video card with a Composite signal input (unusual), your computer won't have the hardware to capture video. We can talk about that after you've got hardware to do it. To create a Audio Cd using Windows Media Player go to Start>select Help and Support> then type in Burn a Audio CD. Its is just like Dave said in post# 23 in the second sentence in paragraph one. ogdens: Thanks for your help. So when I use "Windows Media Player" to burn an Audio CD, Windows Media Player takes the WMA file and automatically converts that to a WAV file? (WMA = data file and WAV = audio file? do I have that correct?) I am easily confused and not computer literate.